A utility tunnel is an underground passage that houses utility lines such as electricity, gas, and water supply lines, sewer pipes, and telecommunication cables. Such tunnels are a critical component of smart city infrastructure. The underground utility tunnel constructed in Lanzhou City was the first utility tunnel in Gansu Province. It has a total length of 112.18 km, with the main tunnel accounting for 79.71 km of this. The total investment amount for the tunnel was approximately US$720 million. The goal of this project was to build an effective central monitoring and control management system for Lanzhou City’s underground utility tunnel. 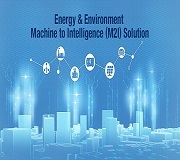 To achieve this, an interconnected communication network was needed for communication between the various subsystems, including systems for environment and equipment monitoring, video surveillance, and security. Thus, the system integrator had to develop an effective industrial Ethernet backbone solution with a hierarchical architecture so that field data can be transmitted from the network access layer to the core layer to realize the goal of central monitoring and control management. The Ethernet network backbone can be divided into three layers: the core layer, aggregation layer, and access layer. Various IP devices, such as video cameras, need to be connected to the access layer; thus, higher bandwidth is required. 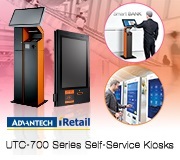 From Advantech’s EKI-7700 L2 switch series, EKI-7706E, EKI-7712E, EKI-7710G, and EKI-7720G were deployed to the access layer because of their excellent reliability. These models were selected on the basis of the number of devices that needed to be connected to the switch; all switches are managed and support X-ring for data redundancy. Nearly 250 switches are used in the access layer. To further ensure network reliability and resilience, Advantech’s Gigabit X-ring topology is utilized to create a redundant network environment with a recovery time of less than 20 ms. Each ring in the access layer is connected to the aggregation layer via link aggregation, where an EKI-9728G L3 aggregation switch is placed with 1+1 redundancy; additionally, network security is ensured by using an EKI-7428G L2 aggregation switch to form another ring at the aggregation layer. Due to the complex dataflows transmitted from various sub-systems including video surveillance, unauthorized entry detection, equipment monitoring, etc. at the field sites to the core layer, a high-performance EKI-9728G L3 switch is selected. At the central control room, all the service servers and storage are connected to the EKI-9728G L3 core switch. WebAccess/NMS is used to monitor the entire network at the central room through SNMP protocol. 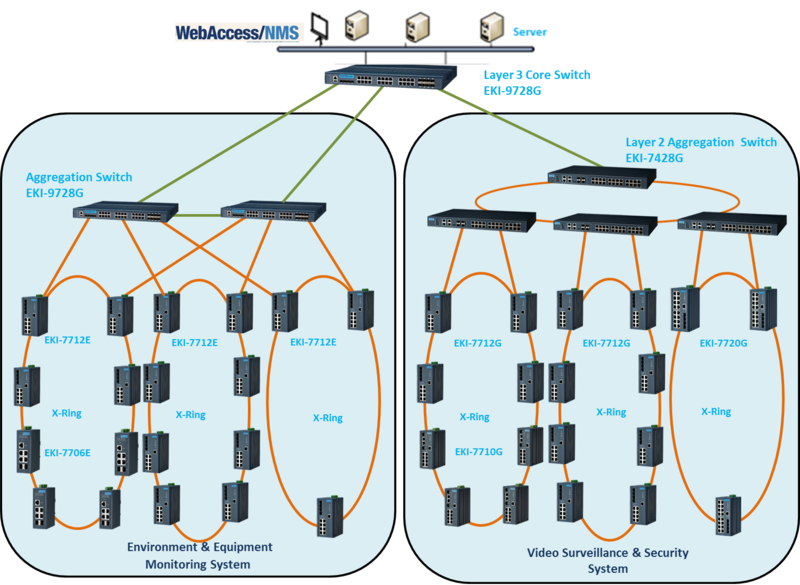 WebAccess/NMS can automatically discover and diagram the network topology and monitor the network performance and the field equipment conditions remotely. 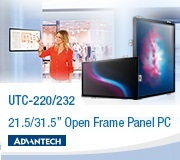 Product Reliability: Advantech’s switches are designed to deliver the highest quality. To ensure data protection, the embedded X-ring technology for data redundancy offers greater protection. Moreover, the recovery time of less than 20 ms is particularly critical considering that there are nearly 250 switches deployed in the access layer. Network Reliability: To ensure undisrupted data communication, a network backup mechanism must be in place in case of a malfunction. EKI-7700 series switches support IEEE 802.3ad link aggregation and STP features to provide additional protection for network reliability. The 802.3ad standard and STP feature help to increase the data bandwidth and provide a reliable network backup mechanism for data redundancy; when a mishap occurs in the connection to a core switch, the backup trunk link will take over data transmission, which ultimately gives additional protection to the network. Quality of Service (QoS): EKI-7700 series switches provide QoS function to improve dataflow management, especially for continuous dataflows such as video surveillance streams. Security Protection: EKI-7700 series switches provide MAC address and IP blacklist/whitelist security protection. They can thus restrict or authorize traffic and support SSH and SSL encryptions for administrator purpose. 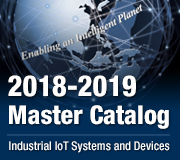 In summary, Advantech offers a comprehensive portfolio of industrial communication products to facilitate establishing highly resilient interconnected networks. Different dataflows can be seamlessly transmitted from field sites to central control rooms for remote storage, monitoring, and analysis. 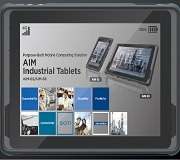 By using Advantech’s solution, the system integrator was able to connect various devices and machines together on the same network to ensure communication interoperability. Thus, they successfully built an effective Ethernet backbone to ultimately facilitate the realization of an effective central monitoring and control system.